I am currently working on a custom gamemode that uses popup HTML windows to implement some of its functions. My issue is that sometimes, steamwebhelper will spontaneously crash. When this happens CS:GO does not restore Motd functionality whatsoever until you restart the game. This looks like an oversight to me since when i manually end the steamwebhelper process trough the taskmanager the news/blog browser on CS:GO's homescreen will automatically restart and restore functionality, not so the Motd browser though. Already tried to opt in / out of betas, clear the Steam browsers cookies & cache and so on. Is there something else that i could try possibly? For me locally, it consistenly crashes when i attempt to open a popup for the second time. It did not use to be remotely this bad but sort of became gradually worse. When trying the same thing on my Laptop / asking friends to try it it isnt remotely this bad either, but my problem is not that it crashes, my problem is that it wont restore when it does. If the crashing in itself could be fixed that'd be obviously great also. One being alert and another being input. While they work as expected the first time, the window is then unresponsive until you restart the game. 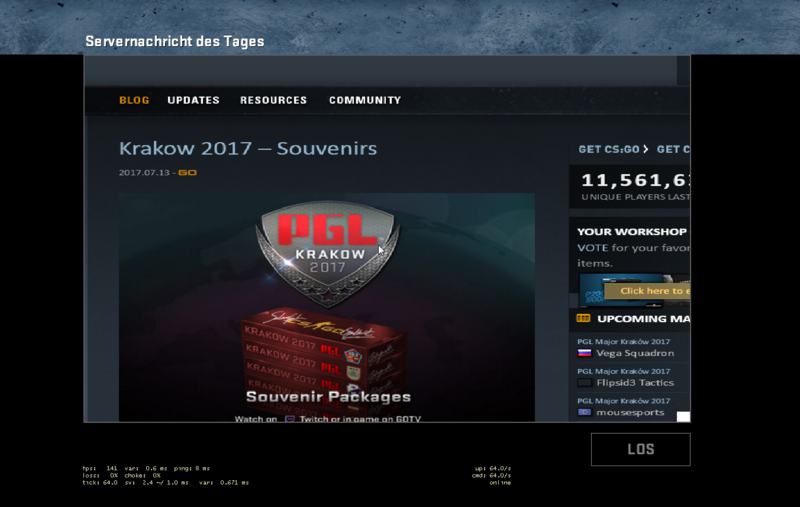 I still state Valve should allow a servers to open windows in the overlay browser. Right before starting csgo i cleared the steam browsers cookies and cache. As you can see, on the third time opening it i get the loading cursor, indicating steamerrorreporter doing its thing and then its broken. Afterwards i am unable to use Motd whatsoever, rejoining doesnt help, only restarting the game fixes it. It didnt use to be remotely this bad for me, but now it is and i have no idea how to fix it. As mentioned beforehand, its not this frequent for my friends either. This is what the Motd will look like when joining a server while its "broken". Essentially, the news browser but broken obviously as its prolly accessing the wrong steamwebhelper instance, if even (cant interact with it). Alright, this seems 100% reproducible. Just tried it on my tablet and got a friend of mine to test it as well with the same result. I hope they fix this quick because this is pretty much the only thing holding me back from releasing a mode that i've worked on for 7 months. Any workaround, like using the steam overlay, would unfortunately not work out for me. The Popup browsers are the perfect implementation for that i use them for (except that they are not focused by default when opened, but thats just me being nit-picky). Not sure if related, but there is a known webhelper crash that they (Alfred) was already working on a fix for as of a few days ago. A Steam Beta update just went out. Not sure if that is to contain the fix or not. friend of mine to test it as well with the same result. indicating steamerrorreporter doing its thing and then its broken. not this frequent for my friends either. until you restart the game. cache and so on. Is there something else that i could try possibly? Beta update just went out. Not sure if that is to contain the fix or not. Just downloaded the Beta update, that indeed does seem to fix this special case. This thread still is relevant though IMO since the other issue is still existant (obviously, since its a bug from CS:GO and not Steam): IF the browser should crash (because it still does that spontaneously sometimes), functionality wont restore until you restart CS:GO. Seems like an oversight to me, and should not be that hard to fix. CS:GO uses Steam's ISteamHTMLSurface, so no, it wouldn't be a CS:GO bug, but instead an issue in Steam (Client). browser should crash, functionality wont restore until you restart CS:GO. Seems like an oversight to me, and should not be that hard to fix. but instead an issue in Steam (Client). As i am not into the inner shenanigans of Steam: When killing steamwebhelper manually the browser on CS:GO's homescreen will automatically restart and restore, not so the Motd browser though. In this case, is the not-restarting of the motd browser really related to Steam, and not CS:GO?